Mobile phones and Windows Phones. These are the phones that are available in this day and age. Nokia has just announced the soon to be released model of a Windows Phone. This new phone is known as the Lumia 900. This device has a 1.4 GHz CPU and is a very powerful unit. It is very responsive when it comes to speed. The display is a 4.3 inch AMOLED display and is an upgrade form the 3.7 inch LCD screen. You will find two cameras, with the rear-facing camera being the same one that is inside the Lumia 800. The front-facing is mainly in existence to handle videoconferencing responsibilities versus taking pictures. There is 16Gb available for storage along with 512MB of RAM. Currently there is no definite announced launch date, but the rumor mill has it that the launch date is March 18th of 2012. It will be sold through AT&T. Currently there is no information available regarding what the pricing is or when it is going to be available globally. Due to a joint venture that took place in 2011, Nokia and Microsoft will be combining forces in the next few years ot come and it will be interesting to see what else will come from this partnership. Nokia offered the hardware expertise and Nokia needed the mobile OS expertise to use with their hardware. This will really be exciting to see. This partnership could possibly give Apple and Google a good run for their money in the mobile phone industry. 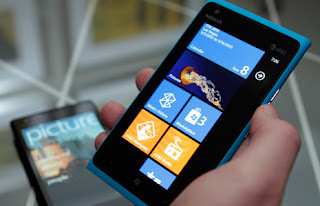 They have started with the development of the Lumia 900. So in the next few weeks and months, keep an eye out for the actual announcement of the release of the Lumia 900. It will be interesting to see if there will be people lined up for the release like people line up or have lined up for the iPhone. 0 Respones to "The New Windows Phone"